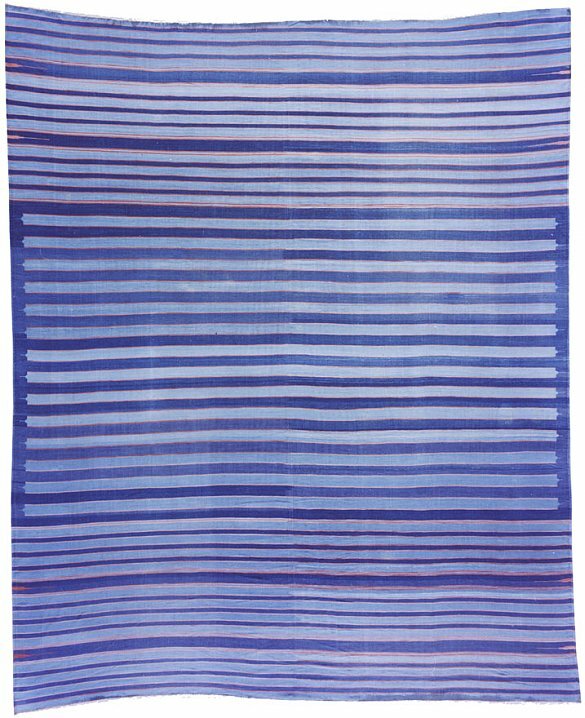 Cotton Dhurrie - 13'3" x 16'3"
This exquisite antique Indian Dhurrie has a classic bars and stripes in the loveliest shades of blue. The central rectangular zone in deep cornflower blue has pale blue bars with stepped edging. The panels above and below reverse this scheme with darker blue bars on a pale blue ground. Throughout, the various bars have additional thin striped edging in gold to sharpen the overall color effects. The beauty of the palette results not only from the quality of the dyes, but from the subtle variation of the tonality used consistently across the rug.